Molly Nesbit’s Their Common Sense (Black Dog Press) isn’t exactly an art bookit’s not exactly a book even, in the usual sense. But in the unusual sense, Nesbit’s tome is a marvelous document, swinging briskly between the teaching of mechanical drawing in French schools and the arcanery of Duchamp & Co. It begins in very big print with Antonin Proust’s proposal that all French schoolchildren learn to draw and ends with a memorable still from Pabst’s Joyless Streets. In between? Children’s drawings (not the cute, creative ones, but disciplined, drafting lesson productions), some very funny ads and cartoons, and some very serious analysis of Duchamp, Cubism, and Surrealism. And don’t overlook Steve Baker’s lively, informative, provocative (and readable) The Postmodern Animal (Reaktion). Kafka, Deleuze, Derrida, Michel de Certeauand beasts. What more could anyone want? 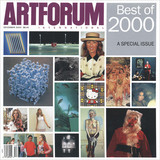 Order the PRINT EDITION of the December 2000 issue for $17 or the ONLINE EDITION for $5.99.